The gumbo limbo tree was used and admired by the Mayan people. The gumbo limbo tree (Bursera simaruba) grows from southern Florida, through Mexico and Central America, in the Caribbean, and throughout Venezuela and Brazil. Mayans believed the gumbo limbo predicted the coming of rain when the tree blossomed. They would plant branches as fence posts, which would then grow to become mature trees (living fences!). Mayans used the peeling bark of this tree for many health issues, according to Mayan written records called codices. 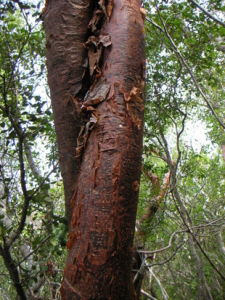 The bark of the gumbo limbo tree was used to reduce inflammation, relieve pain, and stop bleeding. In Belize, skin conditions such as insect stings, rashes, skin sores, and even sunburn are still treated with gumbo limbo tree bark. Mayans wrote in the Dresden Codex that the bark could heal wounds, reduce fevers, and neutralize venom.